From Alaska to Minnesota to Vermont, ice fishing is one of the most popular winter sports. It’s also one of the coldest sports, since you are subjected to subzero temperatures while spending all of your time on the ice. To enjoy this cold weather sport, you need to wear the best ice fishing boots to protect you from the extremes. We have provided helpful information on the top brand names and styles, so that you are prepared. The Muck Arctic Pro offers ample protection from the cold with its 2mm thermal foam underlay and 8mm CR flex-foam bootie with 4-way stretch nylon. Your feet will stay warm and dry even when the temperature drops to -60. These boots are equipped with a stretch-fit top line that keeps the cold from entering the boot. Ideal for ice fishing as it has a bob tracker outsole that will keep you on your feet. The Arctic Pro is constructed with an EVA molded midsole and a contoured footbed for comfort. Furthermore, this particular boot is 100% waterproof, with a breathable air mesh lining that helps eliminate sweat and odor. This boot is specifically designed for outdoor use and can protect your feet and allow you to enjoy ice fishing comfortably on the frozen lakes. Traction on the ice is essential, and with the ice grip outer sole and unique lugs, the LaCrosse Hunt Pac Extreme will grip the ice aggressively. 2000 grams of Thinsulate insulation will provide you the warmth you need in cold climates, while staying lightweight. The LaCrosse Hunt Pac Extreme is equipped with removable EVA footbeds that provide comfort and additional insulation. In addition, your feet will remain dry with a waterproof barrier that lines 100% of the boot, allowing moisture to escape and keeps water out. Equally important is the reinforced heel and toe cap that prevents abrasion in the heaviest wear areas. Enjoy great support with the comfortable nylon shank and easy lace-up feature. These leather Hunt Pac Extreme boots were made for walking on the ice and snow and are designed for comfort, warmth, and stability. If you’re in the market for an extreme cold weather boot, then Baffin Men’s Control Max Insulated Boot offers Thermaplush 8-layer removable liners, capable of a temperature of -70 F while providing additional cushioning for comfort. These boots feature Timberwolf leather uppers with a top cinch to keep the cold out, plus the seams are fully sealed to keep the moisture out. Gripping icy surfaces are easy with the full-traction Icepaw rubber sole. An Arctic Flex midsole provides a comfortable platform for your feet while standing for long periods of time. 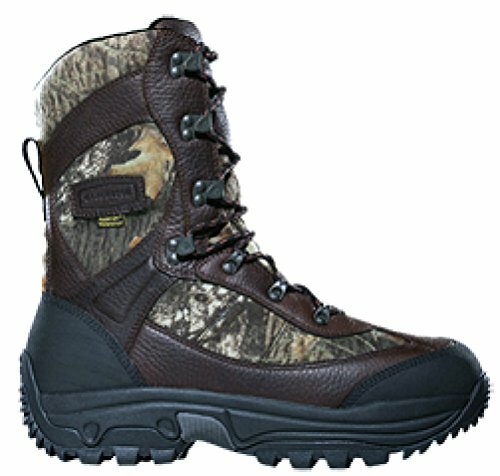 As a cold weather boot, it’s ideal for those who ice fish, snowmobile, or enjoy any outdoor winter weather recreation. 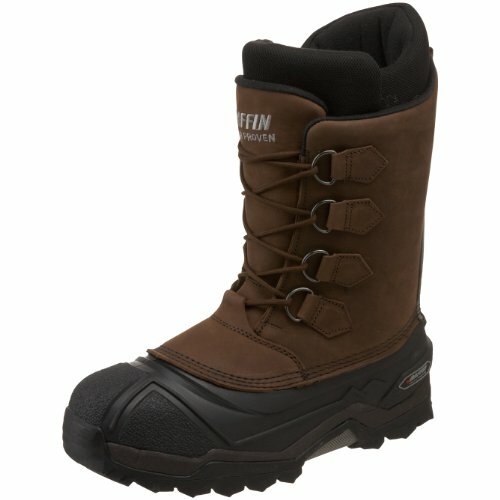 With all of Baffin winter series boots, they are battle-tested in the conditions they are constructed for. The Control Max comes with a traditional D-ring lace up feature that allows you to easily adjust for optimal support. The last thing you need while ice fishing is cold, wet feet. 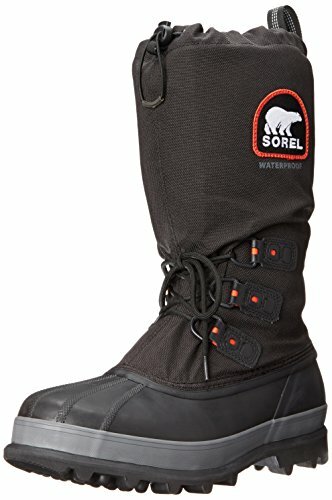 The Sorel Bear Extreme Snow is a rugged snow boot featuring waterproof polyurethane-coated upper with drawstring and barrel-lock closure to keep the elements out. 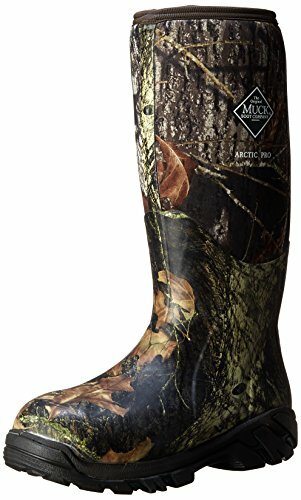 A removable 9mm recycled felt inner boot with omni-heat reflective lining combined with a 25mm bonded felt frost plug midsole are designed to keep you warm with a rating down to -60 degrees F. The handcrafted waterproof vulcanized rubber shell with sorel aero-trac non-loading outsole and 13.5″ shaft keep you secure and up on your feet. 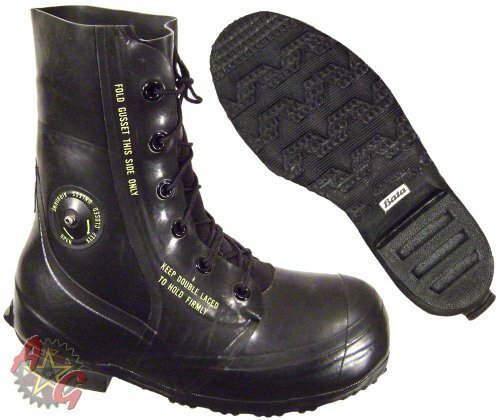 These boots are not an imitation; they are the original military “Mickey” cold weather boot made in the USA. Insulation is provided by multiple layers of wool felt and are designed to keep your feet protected and warm in below freezing temperatures down to -20°. The rubber exterior of the boot is completely waterproof and they’re equipped with a valve to be utilized in high altitudes. 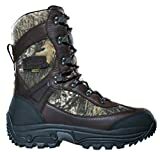 These military grade boots came directly from the United States Government and are designed to be durable and comfortable whether you’re ice fishing, snowmobiling, or just treading through the tundra. These particular boots tend to run a size larger than average and are purposely made that way in order to accommodate a thick pair of socks. For serious, durable protection in snow and ice, the Alpha Ice King Cold Weather Boot provides warmth and comfort with 800g of Thinsulate Ultra Insulation. Soft shell constructed with a leather clad neoprene exterior that wicks away water and a rubber Alpha-lite outsole that grips the slippery surfaces so you can concentrate on your activities instead of worrying about losing your footing. In addition, these boots feature a nylon support shank and a removable Radientex heat reflecting lining that reflects heat back to the foot. A convenient, secure lacing system incorporated on the boot keeps the laces tied securely so you won’t need to readjust your support and fit, which is especially convenient if you’re wearing heavy gloves. These cold weather boots are used for ice fishing, snowmobiling, mushing, hunting and any other outdoor activity where you will be subjected to harsh temperatures. Check out our best hunting boot reviews as well. When in the market for the best ice fishing boots, there are a few things you’ll need to consider before purchasing. Insulation – What sort of temperatures will you be subjected to? Ice fishing boots come with various levels of insulation. The colder it is, the more insulation you’ll want to maintain the appropriate level of warmth and comfort for your feet. Thinsulate offers adequate warmth while staying lightweight, while others such as fleece or wool are heavier, but provides extra comfort. Waterproof – It’s essential to have a waterproof boot for ice fishing since your feet will be subjected to moisture whether it is ice, slush, snow or water. Before purchasing a boot, be sure that they will withstand the water they are subjected to so your feet will remain dry. Size – Most people like to pair their cold weather boots with thick socks. If you plan on doing the same, choose a size that will accommodate the extra layer. Traction – Another important feature you should consider is traction. As we know ice and snow can be slippery and you want a boot that will keep you on your feet instead of on your backside. Removable Liners – After a hard day of fishing, it’s an added benefit to remove the liner and let it air out. Moisture and odor can accumulate while wearing the boots and you want them to be ready for the next day. You’ve got your boots, now what are you going to wear with them? Socks are an important feature when it comes to wearing boots. How do you know which socks will help to keep your feet warm and comfortable? Waterproof Socks – Outdoor activities can be very harsh on feet, so when you are subjected to wet conditions, there is nothing more beneficial than having a sock that is designed to keep your feet extra dry. Even with a waterproof boot, you can never have enough protection from the elements. Heated Socks (Read our reviews) – These are another excellent choice, especially in extremely cold temperatures. While this may sound dangerous, they operate with a low-amperage battery and are shockproof. Thermal Socks – Thermal socks are thick, warm, and wick away moisture. They provide extra padding for a comfortable fit, plus prevent blisters and chafing. In addition to socks type selection, you also need to consider the materials involved in socks. For instance, Merino wool, replaced the traditional itchy rag-wool material. A benefit of Merino wool is that it is thermostatic, which means they sufficiently regulate the temperature so your feet remain comfortable. Socks may be constructed out of synthetic materials as well, such as Nylon and Lycra. Synthetic socks retain their shape, add support, and conform to the feet. Plus, they also wick away moisture. Socks purchases should be well thought out, so you’re confident that you’re getting the best for your feet and your circumstances. With these reviews, we’ve provided valuable information on the best ice fishing boots available, so you can be confident in your selection when purchasing for your next ice fishing adventure. We only provide reviews of the top brands of boots that have earned good reputations from owners. We take pride in our research and we want to help you to be happy with your decision.